Registration is Now Open. Early Bird Rate Expires August 1. 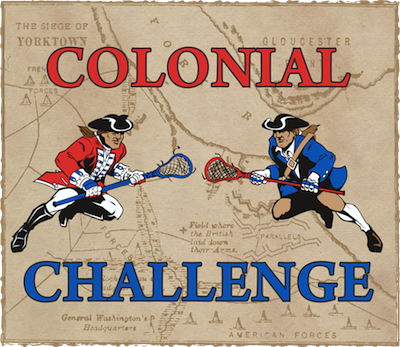 The tenth annual Colonial Challenge lacrosse tournament will be held on Sunday, November 10, 2019 in Williamsburg, Virginia with all games being played at the Warhill Sports Complex. This is one of the finest tournament facilities in the nation, consisting of 13 adjacently positioned fields. Seven are regulation-sized synthetic turf fields and six are regulation-sized Bermuda grass fields. The facility also has multiple permanent bathrooms, plenty of parking just a short walk to the fields, and is located just minutes from Colonial Williamsburg, Busch Gardens and Water Country USA. Numerous, affordable lodging and dining options are, likewise, a short distance from the fields. The Colonial Challenge is a one-day 10 v 10 tournament-style event with divisions limited to eight teams, all of which are guaranteed a minimum of three 52 minute games. Divisions for A and B level teams are offered at the high school level. At the youth level, divisions are offered based on graduation year, beginning with the class of 2024 and continuing through the class of 2029. Programs that field youth teams using US Lacrosse Age and Eligibility Guidelines may also participate and will be placed into divisions that provide the most competitive matchups. Every effort is made to provide all attendees with a wonderful tournament experience. First, a unique bracketing system, which aims to create competitive match-ups for all, is employed at the Colonial Challenge. Next, the tournament provides field attendants and scorers tables with scoreboards on every field. Finally, end line balls and/or netting systems are also on every field. Teams that are registered and paid in full by August 1 qualify for the Early Bird Rate of $875. After August 1, the registration fee is $975 per team. Registration Forms and non-refundable deposits of $400 are being accepted on a first-come, first-served basis. Balance payments and a Roster Form must be received by October 25. Online Waiver & Release Forms, which all participants must complete in order to participate, need to be submitted no later than Thursday, November 7. For more information, or should you have any questions regarding the Colonial Challenge, please contact Chris Swanenburg at (443) 690-7683 or at director@capitallacrosse.com.